Dancers taking these workshops should be comfortable picking up new moves and steps fairly quickly, understand how swing music is structured and the concept of creating your dance to the changes in the music. In addition, dancers in the advanced workshop should incorporate good frame and connection in their everyday dancing. It’s the track that everyone tries to get in then complains about anything possible related to it if they don’t make it in, the Higher Level/Advanced class! We’ve all met and/or have been this guy. How Fierce Are You To Your Advanced Class? I was told by one of my students last week that I’m really scary in my advanced class and she was surprised because I’m so friendly and easy going in my lower level classes. I told her I meant to do that because I really mean business when it comes to who gets into my advanced class. I won’t throw people out, but I won’t make it easy for them to stay either. I don’t teach particularly hard stuff and mostly just mechanics that makes sense. This doesn’t mean that it’s going to be a cake walk or a “just wing it” course either. I agree with you: Beginner and intermediate classes are supposed to be fun. However, once you get to the advanced level, you can begin to expect more from your students and push them a little bit. There is a difference between a fun hobby, and a craft. As you begin to get to an advanced level, you are starting to approach what you are doing as a craft. It requires a tad more seriousness, hard work, and discipline to start to take things to the next level. People will never improve unless they are open to criticism. Also, I think it is smart that you are encouraging peer criticism. And there is nothing wrong with saying: When you come to my class, you better bring your game. If you don’t, I’m going to call you out on it. BUT, having taught dance classes and privates, I have to say there is a difference. Most people who take dance classes (especially beginners) are not pre professional or aspiring professional. They just want to have a little fun and learn something new — a new hobby. I think in that case, it’s good not to take the class or yourself too seriously. Fun is the 1 goal, and dancing is the 2 goal when I teach. As the level of dancer increases, I get more serious. With that said though, I always leave the drive to get better up to the student. So, I don’t demand they practice, for instance (although I will notice if they have and compliment them). With advanced dancers, (I haven’t had the privilege of teaching many truly advanced dancers), I’m very much to the point, and fun is not part of the focus. The fun is more innate. The common theme I noticed in nearly every post in the thread was the idea of for classes targeted toward newer dancers fun and entertainment should be more of a priority. Whereas in a more advanced class the idea of students should be expected and prepared to be pushed hard in terms of seriousness of the class. How to have a good Advanced Class …? Another thread from 2004 titled Spinoff Class Thread: How to have a good Advanced Class…? by a local NYC organizer proposed the question what is an effective way to conduct an advanced class, in which the event the Harlem Jazz Dance Festival advanced class was quoted a few times. Basically I reiterate what I’ve said earlier: if you want to improve the advanced dancers in a scene, they have to interact with each other, grow together, and create, invent, and share information in a non-hierarchical way. Information would not be disseminated from one all-knowing source, but shared. How did the HJDF class go last year? I’ve no idea since I was running around like a maniac the whole time. Is there a way we could make a model like that work for us? With a few pairs of “instructors” guiding the process. They would come in with a few ideas for things to work on and let things evolve from there. It wouldn’t be so much a class about moving fast but about refining and helping one another and asking questions. This might end up being more like a guided practice session and might not require such selectivity as long as it was made clear it was supposed to be for advanced dancers. I think it’s way too complicated. Advanced classes should simply be for people who aren’t afraid of getting shredded to pieces. If you’re that serious about the dance, you have to be prepared and accepting of some ego-bruising. I think that may be the mark of a truly advanced dancer. One who can take real criticism and still be standing afterwards. One of the things that happened in Jenn and Justin’s Master class in Ithaca (which happened almost 2 years ago) was they had people dance, one couple at a time, in front of everyone, and then they criticized what they were doing. There was no sugar-coating. It was brutal at times, but the students took it in stride. And I think, at some point, instructors should be able to be free to take the kid gloves off and say what they really think without getting into trouble. I think at some point, a dancer needs this kind of honesty in order to grow. But we have to give them permission to be so honest, and not punish them when we don’t like what they say. What you need to ensure this is a decent selection process. I like having a preliminary “sorting round” to determine placement. Run the class for a few minutes with everyone, and pay attention to see who’s cutting it and who isn’t. Then just make a cut. The people who don’t get cut are free to sit around and keep watching if they really want to, but you’re going to have to ask them not to rotate. And you’re going to have to deal with the consequences of that decision. This, I think, may be the crux of your dilemma. You want to have a rigorous selection process, but you don’t want people to hate you or call you an elitist because you didn’t pick them. Unfortunately, you can’t control whether people will hate you. If they do, that’s their problem. People are ultimately responsible for their own feelings and actions, and if they’re going to get in a tizzy because Nicole didn’t validate their dancing skill and put them in the top class, that’s their damn fault. You didn’t do anything to them – you’re just trying to construct an advanced class – hell, if you let them watch but not rotate you’re not denying them ANYTHING – they still have access, but now the responsibility is on THEM to grok it and keep up, not on YOU to make sure that they’re keeping up. The two things argued in this thread were if the class should be more of a guided practice session versus a traditional teacher/teachers and students setting and if the class should be auditioned/people should be cut. I noticed a trend however of individuals noting that being able to take harsh criticism was a skill people should have if they want to start taking lessons at an advanced level. Contrasting that were posters who were concerned about not coming off as elitist and bruising egos. When teaching advanced classes or classes targeted toward higher level dancers do you change your attitude/methods compared to a beginner level class and if so, how? It’s hard to say exactly because each group is different and so teaching changes from class to class. But I think there is a general difference between the levels. With beginners most of them aren’t addicted to the dance yet and so I emphasize the fun in the dance and not taking things seriously. With advanced dancers I feel free to push them a little harder and give them things that they’ll struggle more with. This is because I expect them to practice it on the dance floor and eventually be rewarded for the effort. But for advanced dancers I have a hope that they’ll have a grasp on important modular pieces of the dance. For example; a good tuck, or how to kick step through a turn, or a forward rock, or even different kinds of stretching. I think at the beginner level the goal is more about teaching things that mostly exemplify those modular pieces (and are fun to do besides), rather than the advanced level of applying them in unexpected ways. Otherwise methods of explaining in as few words as possible while hitting visual, audio, and kinesthetic learners is the same. Beginner – Here is a cake, and this is how might consider eating it. Intermediate – This is chocolate cake, and there is a cherry on top, So it might be rich. Advanced – This is, in fact, a chocolate cheesecake, with a toffee – chocolate wafer crust. On top is a light mousse, shavings of dark chocolate, and indeed, a cherry. It will be rich, so you’ll definitely want to consider how you will be eating it and the company you choose to eat it with. I’ve mentioned before one of the things I like about the Lindy Hop community is for the most part accepting and welcoming to people. I would argue that it is a major strength of our community. However I would argue one of the problems our community has is we fall into the fallacy this article lists as number one, ostracisers are evil. Those people got in because they were friends with X.
I didn’t get in because I danced with X and Y, they made me look bad. Your goal is to teach a -real- advanced class where you have some sort of control over who participates. Your goal is not to make everyone happy and comfortable with themselves. While that’s certainly a good thing to want to do, it is literally a tradeoff. You can’t preserve the integrity of an “advanced” class unless you break some hearts. There is no real “right” answer to this question over all, each choice will definitely have some ramifications good and bad. While the way I suggest might be great for a bigger scene with a decent portion of solid dancers… for a small scene just starting out this could cause some serious problems. What are your experiences with good or bad advanced level classes? If you could make an ideal advanced level class how would you have it run? What are some apprehensions of the social ramifications of having an auditioned or invitational only advanced level class? Feel free to leave anything related to this in the comment sections below. This entry was posted on September 24, 2012 by Apache. It was filed under Dance, Lindy Hop, Running a Scene, Teaching . Really surprised no one else has commented on this. If you are running a regular local class then I think you should be tough – if students aren’t getting the material and aren’t good enough for the class tell them. One London teacher was notorious for kicking people out of his intermediate class if you weren’t up to scratch. People did get upset, some people never came back but most people did more classes until they were judged good enough to join the intermediate class. Good for the students, good for the class as a whole but really tough on the teacher who has to handle bruised egos and the student’s reaction. Joining the class was something to aim for, it took many leaders two years to get there, but getting into the class gave people a sense of accomplishment and was a bit of a rite of passage. Yes it did create an ‘elite’ group but it was a big group and it was a group that anyone could join provided they practiced enough. Now this is teacher is being nice and I can’t remember the last time anyone was asked to leave. Leaders join the class after a couple of months of beginners and the classes are taught at a much lower level, the more advanced dancers no longer come to the class let alone the social dance afterwards and the scene feels like its dying. I’m on the executive of a university club that has run a multi-track workshop for the last 3 years, and figuring out how to filter for the advanced track has always been interesting… At the beginning we flat-out stated, “We are doing auditions, will always be doing auditions, because we want something for the top dancers” (for a scene of a few cities that is admittedly still relatively young). The format was to be a two-track workshop, with “intermediate” for the general workshop public (ie. you could do a swingout without struggling too much) and “advanced” for the dancers who have been doing workshops for a while and wanted more of a challenge. As the local workshops run by the off-campus have a well-deserved reputation for bringing top-tier instructors, so would we, but two pairs to accommodate the two levels. The first year we ran it, the audition process was set up so instructors would have the final say, but some of the organizers would be there to provide some insight. There was only a few people cut in the auditions as it was mostly just the level of dancer we were catering to for the advanced track who auditioned. However, one of the dancers who was cut took it very personally, and immediately after the first day of workshops began complaining. Said dancer left the scene a year or two after this incident, but has always held a grudge against the club. Year two came around, and this time we decided to leave the audition process completely in the hands of the instructors, no organizer input. This, along with bad communication on what our expectations were for the class, led to a smaller class size than we had advertised, and one or two dancers who were flashy but not as technically proficient getting into the class. Again, some unhappiness but not quite as bad as last year. The third year we went to the other end of the spectrum; we still held “auditions”, although we asked the instructors to pass everybody. We also added a beginner track taught by local teachers, partly to cater to newer dancers, but also to pull the slower dancers out of the intermediate track, as there was the occasional grumble in previous years about the speed of that track. There was no unhappiness or complaining reported this year… however due to the self-selection for advanced, there was one or two dancers who made it into advanced despite having horrible technique, thus slowing down the class. As for perception of how well the classes went? I would say the first year was the best of the three from my perspective as the students all seemed to have the technical chops required, thus no slowdown. The third year was better than the second, as while there was about the same number of technically unsound dancers, there was more technically sound dancers to focus on in the third year. For the next year I would like to take the approach Marcelo recommends, as I believe the scene has matured to the point where we won’t see a repeat of the grudge-bearing dancer. Yes, we have had this same problem in my home town. It is universal. I recall being in the ‘Advanced’ class in Herrang one year, and the next year considering going up to ‘Advanced Plus’. A friend advised me to do advanced instead, saying that I would be one of the best leads in it, and so the girls would love me. I took his advice, and it turned out to be good, and I had a nice holiday, but I noticed that the people doing ‘Advanced Plus’ were the people who had been in my class the year before. They had just picked the next level up, Doing ‘Advanced’ one year qualifies one for ‘Advanced Plus’ the next, right? The following year, I did ‘Advanced Plus’. I should have, and I should not have. 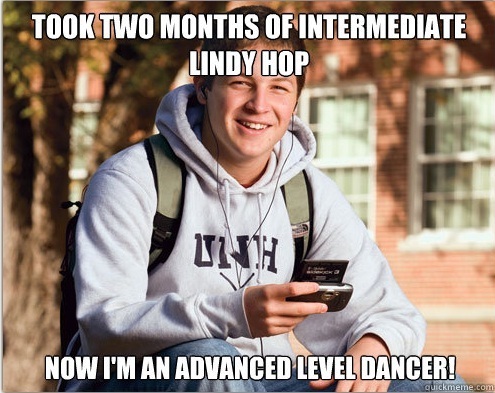 I was not a super-advanced dancer, therefore I should not have been in the class. I was, however, one of the best dancers in the class, so I should have been in the class. In truth, I think that there were about 3 dancers in the entire class that were genuinely super-advanced, and the rest of us were all out of our depth. The teachers were disappointed with us, but not great at adapting their lessons to the pupils they had. If we were the best dancers at the camp, then we were what they had to work with. When teaching, it is a frustration to me when I cannot teach what I wanted to teach, because my pupils are not ready for it yet, but I adapt to the class. If I adapt to much or too readily, however, then my scene will not improve. We all want to be nice and be liked, but we all also want our scenes to grow not just in numbers but in quality. A bit of ruthlessness is required. Many of these problems would disappear or at least fade if my scene were larger. I would like to form a dance troupe, and have auditions, rejecting all but the best dancers, and then create an elite that others might aspire to join, but the truth is that getting enough people together for a troupe, who can do the basic footwork and make the rehearsals is difficult enough. I cannot afford to be choosy. One piece of advice I read in Ali Taghavi’s book offers a compromise. He suggests paying most attention to the best dancers in the class, not those who might be left behind. If the better dancers are ‘getting it’ and improving, and finishing a class able to do the moves well, then your scene gains some more inspirational dancers, and the weaker dancers might eventually twig that they are not as good as they thought they were. So, adapt, try to inspire, and reinforce success.